Huitzilopochtli, the Aztec god of war, was associated with the sun. His name, which means "hummingbird of the south," came from the Aztec belief that the spirits of warriors killed in battle followed the sun through the sky for four years. After that, they were transformed into hummingbirds. In some myths, the warlike Huitzilopochtli appears in contrast to his brother the god Quetzalcoatl*, who represented life and the gifts of civilization. According to legend, Huitzilopochtli's mother was the goddess Coatlicue. One day she found a bunch of hummingbird feathers and stuffed them into her breast. She immediately became pregnant with Huitzilopochtli. However, some of her other children—a daughter named Coyolxauhqui and 400 sons—were jealous of the unborn child. 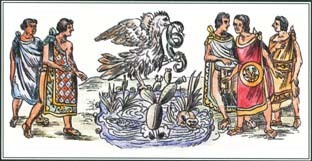 They plotted to kill Coatlicue, but when they attacked her, Huitzilopochtli emerged from his mother's womb fully grown. He cut off the head of his sister and killed most of his brothers as well. The Aztecs believed that to nourish Huitzilopochtli and keep the world in motion, they needed to feed the god human blood every day. For this reason, Aztec priests conducted daily human sacrifices at the Great Temple in their capital city of Tenochtitlán. During these rituals, victims were led up the steps of a pyramid, and while they were still alive, their hearts were cut out of their chests. The victims' bodies were then thrown down the steps of the pyramid onto a stone that featured a carved image of Coyolxauhqui. In this way, the sacrifices reenacted the story about the young god killing his sister. One legend about Huitzilopochtli, the Aztec god of war, concerns the origin of the city of Tenochtitlán. The god told the Aztecs to settle at a place where they found an eagle perched on a cactus. * See Nantes and Places at the end of this volume for further information. a long journey south in search of a new home. The god told them to settle at a place where they saw an eagle perched on a cactus growing out of a rock. As predicted, they saw the sign described by the god and ended their journey. This story echoes some events in Aztec history. In 1345 the Aztecs were driven onto an island in the middle of a lake by a tribe called the Culhua. There they founded Tenochtitlán, which would later become the capital of the Aztec empire. See also Animals in Mythology ; Aztec Mythology ; Coatlicue ; Quetzalcoatl ; Serpents and Snakes .